Information on soil and land as a basis for planning, remediation or management activities concerning, amongst others, instruments for recording and monitoring soils and land use potential, methods and techniques of remote sensing, as well as the construction and further development of information systems. 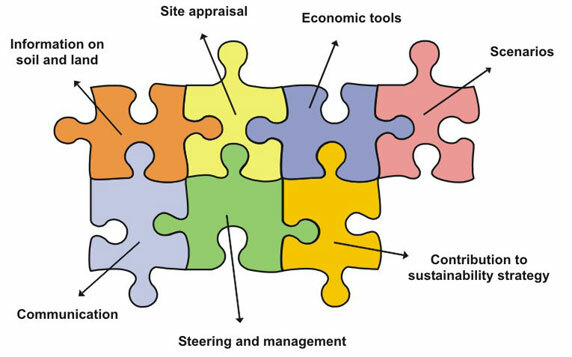 Site appraisal is concerned with the development of selected sites, with emphasis usually being given to the development of integrative assessment methods comprising economic, ecological, social and urban development aspects. Economic tools comprise the development of support programmes for brownfields, opportunities for funding land revitalisation and sustainable land management, and gaining new insights into the relation between the development of residential and transport-related areas and fiscal measures and impacts. Estimates of follow-up costs for land allocation in building planning and measures in the housing stock will lead to more transparency concerning investment costs and associated costs in the field of the constructional, technical and social infrastructure, which originate from planning and investment decisions. Scenarios for spatial planning and urban development are used as predictive instruments for strategic planning on different spatial levels and to different extents. Steering and management refers to aspects of land management instruments and process management in controlling land use in towns and regions, and between an urban centre and its surrounding area. Different types of land use (residential, commercial, brownfields and open space) are covered. Attention is given, amongst other aspects, to the goals of land use policy on the part of local authorities and regions. Negotiating methods and processes will be investigated as well as participation processes. Communication comprises new methods and concepts for advisory work and public relations both for education and training and also ideas for an exchange of know-how or for the construction of inter- and transdisciplinary networks of expertise. At the same time solutions are sought for improved marketing of the new approaches as well as for improved marketing of existing land use potential.